Cook 1/4 pound assorted wild mushrooms and some chopped chives in a skillet with butter until wilted. Season with salt and pepper. 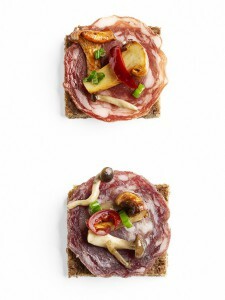 Top 12 pieces pumpernickel cocktail bread with wild-boar salami (or other wild cured meat). Top with the mushrooms, drizzle with olive oil and garnish with chives and hot cherry peppers.